How to install: Leon runs on Windows. After you downloaded the program run install.exe and follow the instructions. Leon doesn't run or crashes: Please contact us. Send, if possible, a screenshot attached to your email and your system's version. Information on doing this is provided in the section "About us". Does Leon cheat? : Definitely no!. Humans often claim that backgammon software cheats. If you don't believe me, you can prove it by yourself. The dice values are selected by a so called "pseudo" number generator. Main property of "pseudo" number generators is the use of a seed. For the same seed value the random numbers sequence that is generated is always the same. Start a game and write down the seed that is used for this game. You will find it in the bottom/right corner of Leon's main window. Play some moves and write down the dice used. Now go to the Options menu of Leon. Write the seed used by your game. Start a new game and play different moves. You will see that the sequence of the dice, for the same seed, will always be the same, independent of the game played or state of the game.If Leon cheats then it would thrown different dice sequences, depending on the game state. But as you will see, this doesn't happen. If you don't believe even this mathematical proof, Leon provides a way to input your own dice. If you still find Leon to be very lucky then... you should better reduce the playing strength level of the program. Why not the doubling cube? : There are already some programs around that play the Backgammon variation in a very decent level of play. With Leon i didn't want to write just another strong Backgammon program. Leon wants to be a very strong Tavli player. You can play Portes with Leon, whice is almost the same with Backgammon except that there is no doubling cube and no tripple games. 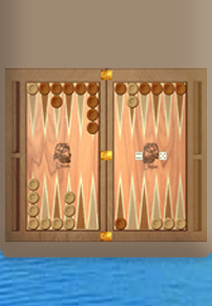 Of course, depending on the resonance of Leon to the community, a Backgammon engine could be made available in the future.